As the Director of Technology at DP Solutions, Richard Carey provides the technical direction for the company by aligning itself with IT trends. 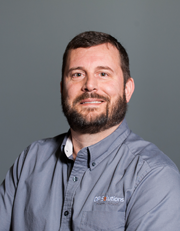 Rich is an innovative leader with a proficient background in IT and an aptitude of foresight that allows him to see what tech trends are on the horizon and how DP Solutions can align with appropriate solutions. Prior to joining DP Solutions, Rich received his bachelor’s degree from Western Governors University. After graduating, Carey worked for Maxim Healthcare Services for six years as a System Engineer. In 2011, Rich joined the DP Solutions team as a Project Engineer, where he did a lot of fieldwork. This allowed him to implement new standardizations in the way DP Solutions manages technology, and are still in use today. Rich’s success in the field eventually led to a promotion to Senior Project Architect. In this role, he worked closely with the former Director of Technology to keep DP Solutions on the cutting-edge of technology. In his new role, Rich hopes to continue this innovation and grow DP Solutions quicker than ever by providing the best technology solutions available. Rich holds technical certifications from VMware, Juniper, Cisco, Microsoft, and IBM.